From Susan Wittig Albert, the New York Times best-selling author of Queen Anne's Lace, comes an intriguing new addition to her widely-acclaimed China Bayles Mysteries. ​China and Ruby Wilcox are presenting their annual "Not Just Plain Vanilla Workshop," always a huge hit with customers at Thyme & Seasons Herb Shop. But someone involved with the workshop is driven by a deadly motive, and China soon finds herself teaming up with the very pregnant Pecan Springs police chief Sheila Dawson to solve a vanilla-flavored murder. Sheila, happy to get out from behind the chief's desk, is investigating the death of a botany professor, a prominent researcher specializing in vanilla orchids. China is trying to help a longtime friend: the dead professor's ex-wife and a prime suspect in his murder. However, there's no shortage of other suspects: a betrayed lover, a disgruntled graduate student, jealous colleagues, and a gang of orchid smugglers. But the lethal roots of this mystery reach back into the dark tropical jungles of Mexico, where the vanilla vine was first cultivated. At stake: a lucrative plant patent, an orchid that is extinct in the wild, and the life of an innocent little girl. 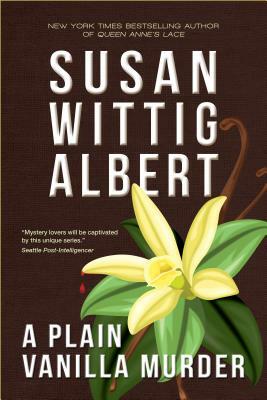 A Plain Vanilla Murder is a flavorful blend of mystery and herb lore, present sins and past secrets, and characters who are as real as your next-door neighbors--stirred together in an absorbing novel that only Susan Wittig Albert could create.